Before I start, I want to tell you what I am actually writing about. I am not writing a book review although it may seem so at first. 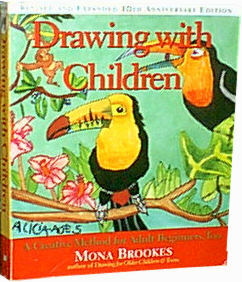 I am writing a series of articles designed for the parent who wants to teach their children lessons from the book Drawing With Children that is written by Mona Brookes. My purpose is to seek out the lessons that are in this book and share this information with parents. The information is useless without the book, so get the book and thumb through it as you read the articles that are linked above. Each article is titled "Lesson" or "Lessons" and its number. They are named after the chapters in the book. In summary - These articles are written for those who want to make lesson plans for this book to use with their children. Drawing with Children teaches representational drawing skills by first teaching the five elements of contour shape. Then the student is guided to see the elements of shape instead of seeing just a chair (for instance). My explanation of the method is simplified, but in a couple of sentences, that is how drawing is taught and has been taught for ages. Lesson two introduces the student to compositional studies. As of this time (2010) I have not written about the rest of the lessons, but from just looking at them, Lesson 3 practices what is taught in Lessons 1 and 2 and that is all I have to say right now. This book takes some effort to use. One must read it and absorb it for a while. I cannot tell you how many times that I have read the parts that are highlighted in red on the right side of this page and the first few lessons. I think the problem that some of us have with this book is making lesson plans in the organized way that is preferred by home school parents. This goes back to my purpose in writing these articles. I will try to sort out the parts that are lessons from the pages of Drawing with Children and present them to you in such a way that will help you make lesson plans. I can do this now that I have retired from homeschooling and do not need to make lesson plans anymore. I did not have time to do this when I was actually homeschooling my children. From what I just wrote, you now know that I did not use this book. When I purchased it in 1995 or 1996, I looked it over and set it aside several times. I looked it over the following year thinking that I could use it, but I never did; I could not "wrap my brain around it" as some would say. I was too new at homeschooling and I had too many other lesson plans to make. The articles that I am writing for donnayoung.org describe what I would have done had I had the time to have studied this book and translated the Mona Brooke's method into lessons plans for my two kids. The reason that I am using my limited time on this book now, when I do not need to make lesson plans, is that I believe the method laid out in Drawing with Children is solid drawing instruction.